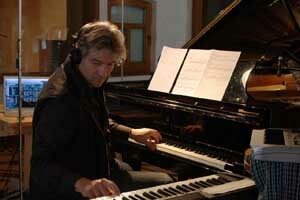 Hans Lüdemann, born 1961 in Hamburg, studied Classical piano at the Hamburg conservatory and Jazz piano at the Musikhochschule Köln and the Banff Centre/Canada. In Köln he obtained the first Jazz masters degree in Germany. Hans Lüdemann‘s motivation always was and still is the realization of his own creative ideas, compositions, projects and improvisations that have been in his focus from childhood on. This handwriting characterizes his groups TRIO IVOIRE and ROOMS as well as his piano solo programs. Interest in musical encounters brought him in touch with musicians and music of Africa and made him a „Wanderer between the worlds“. He developed preparations for the piano, new playing techniques for the historic Clavichord and expands the acoustic piano sound with electronic piano samples to a microtonal „virtual piano“. Hans Lüdemann`s international career started in 1985 in the group of Eberhard Weber/ Jan Garbarek, he worked with a number of important musicians, among them Paul Bley (duo CD), Chiwoniso, Toumani Diabaté, Marc Ducret, Mark Feldman, Dobet Gnahore, Roger Hanschel, the hR Jazzensemlbe, Albert Mangelsdorff, Phil Minton, Angelika Niescier, Heinz Sauer, Manfred Schoof, Reiner Winterschladen and Eda Zari. As a solo pianist and with his ensembles, Lüdemann has performed worldwide and is a regular guest on international concert stages and festivals, also working for radio and tv. Performances include portrait concerts at the Musiktriennale Köln, appearances at the Bachfest Leipzig, Offbeat Festival Basel, Münchner Klaviersommer, Copenhagen Jazz Festival, Nancy Jazz Pulsations, HIFA Festival Harare, Delhi Jazz Yatra, „Vues d‘Afrique“/Montreal, concerts in the „Haus der Kulturen“/Berlin, the Prague Philharmonic, the New York Knitting Factory, the „Tonhalle“ Düsseldorf and the „Teatro Amadeo Roldan“ in Havana/Cuba. Lüdemann has created works from solo to orchestral music and received commisions to compose for the hR Jazzensemble Frankfurt, WDR, NDR bigband, Steinway and Kunststiftung NRW. Lüdemann‘s music is documented on over 20 CDs for renowned record labels, among them „Aphorisms“ (1990), „Futurism“ (1997), „Mysterious Call“ (2001), „Touching Africa“ (2006), „Rooms“ (2010) and three piano solo CDs. In 2012 his biggest project so far, „die kunst des trios“, was released as a 5-CD-box and received the „ECHO Jazz award 2013“. In 2013, Lüdemann founded and directed the „T.E.E. Ensemble“, the new French-German Jazz Ensemble, initiated by the Goethe institute. In 2002, Lüdemann was invited on a journey to Africa with German President Johannes Rau. He was appointed member of the Federal jury composition for the Villa Massimo from 2003 - 2007. He taught Jazz piano and ensemble at the Musikhochschule Köln from 1993 - 2008, directed the „Creative Jazz Workshop“ at the European Academy Montepulciano/Italy 2001 - 2007, the „JeuneJazzJam Paris-Köln“ of the Musikhochschule Köln and CSNDP Paris in 2008 and taught as „Cornell Visiting Professor“ at Swarthmore College/USA in 2009/2010. Hans Lüdemann lives as a pianist and composer in Hoffnungsthal near Köln. 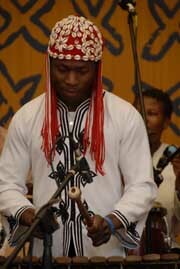 Aly Keita (Balafon) was born in 1969 in Abidjan/ Coast Ivory. He came from a Malinké-family from Mali which has practised the profession of the "Griots" for generations. Griots are traditional singers and musicians. He spent his childhood in Abidjan and Mali, where first Keita learned to play a traditional pentatonic balaphon. His teacher was Zouratié Coulibaly. In 1986 he met Georges Makinto who encouraged him to play jazz music. Keita also developed his own diatonic balaphon which opened up new possibilities and styles. His experiences with Jazz gave him the opportunity to perform in Africa, Europe, USA and he became a well-known virtuoso player. Keita adapted the balaphon to many different musical styles. He has performed with internationaly reknown artists such as Pharaoh Sanders, Amadou & Mariam, Trilok Gurtu, Rhoda Scott, Camel Zekri, Habib Koité, Lukas Ligeti, Rokia Traoré, Gilles Renne, Philippe Sellam, Linley Marte, Etienne M'Bape, Michel Donéda, Xavier Charles, Sekouba Bambino, Paco Séry, Talib Kibwé, Masahiro Sayama, Akétagawa Shoji, Bernard Zadi, Hans Lüdemann und Steve Argüelles. He creates all instruments by himself. Keita and his brothers even built the "biggest balaphon of the world". In behalf of the "Centre de formation et de promotion musicale" in Niamey/Niger Aly Keita gave lessons in traditional and modern music from 1989-1995. He was also teaching balaphon at the school of arts in his hometown Abidjan. In 1999, Aly Keita and his brothers built the world‘s biggest balaphon in Tarascon sur Ariége/France. Since then, also chromatic balaphons have been contructed and a „method for balaphon“ has been released on DVD/CD. He recorded several CDs with Georges Makinto, with the bands "Beta Foly", "African Project" and "Trio Ivoire", with Paco Sery, Omar Sosa, Majid Bekkas, Manu solo and Jean-Paul Bourelly. He also gives solo concerts. The first CD under his own name has been released in 2007 by Contrejour, a solo CD followed in 2010. Aly Keita regularly plays solo concerts and he performed on a two-month tour through East and South Africa in 2010 for the CCF. In 2012/13 he toured in Europe and the US as musical director of the project „Acoustic Africa“. Aly Keita was awarded the German World music prize „Creole“ in 2010. Christian Thomé (drums, electronics) studied at the Sweelinck Conservatory in Amsterdam, Netherlands, using after hours to play in clubs with local bands. Besides the curriculum offered at the institute, he studied a lot of non western music and started researching South Indian Classical music from 1994.He learned the solfege system and other basics of Indian classical music, before going to Bangalore and Madras in 1995. There he studied with mridangist N.G Ravi, student to grandmaster Sivaraman. is at the front of the new generation of european musicians bringing improvised music into the next decades. His versatile approach to jazz drumming and highly personal exploring for new sounds and techniques enables him to bridge the gap between modern jazz, pop-rock, world music, classical music and electro- acoustic improv, constantly inspired to expand his manifold range of instruments. Link laptop-based electronics with an old GDR-zither, join the Hamburg Philharmonics followed by a club set with colognes sample artist Niobe, producing a Ukrainian Singer in his own studio or interpret nursery rhymes with bowed piano: Thomé's aesthetic masters this balancing act. Born in 1970, Christian Thomé grew up in Düsseldorf, Germany, playing music ranging from pop, rock and fusion to swing. He began playing drums at age 14, when he had already been studying the clarinet and piano from up age 6. In 1991 he went to Arnhem, The Netherlands, to attend the Arnhem Institut for the Arts, where he studied with Joop van Erven and René Creemers. During this time he let his own bands and consolidated his skills in composing and arranging. In 1997 he moved to Cologne, Germany, and has since become one of the most in demand drummers in germany's jazz/new music scene today. Christian Thomé has collaborated with Hans Lüdemann before, playing in the trio RISM and later taking part in his project „die kunst des trios“. In addition to co-leading and composing for the groups a si & twice no, Mariana Sadovska & Christian Thomé and Arnie Bolden, Christian records and tours with diverse groups including Trio Ivoir, Niobe, Trio Stockhausen/Comisso/Thomé, Nanoschlaf, Alony, and The Bliss. He recorded the debut CD "diving" of the trio collective Arnie Bolden in his own studio, where he also worked out a major arranging part for the latest CD "Entfernung" of the german pop oriented group Lühning. Christian is currently recording with the trio a si & twice no (Simin Tander - voice and Jörg Brinkmann - cello) and producing the new duo CD with Mariana Sadovska. His latest cd "hauptstrom" and debut album as a leader with his septet Tomatic 7 is available on JHM Recordings. He is teaching jazz drums at the conservatory of Osnabrück. He also performed with musicians, including Lee Konitz, Peter Kowald, Evan Parker, Michael Moore, Dhafer Youssef, Michel Godard, Rainer Winterschladen, Ike Willis, John Goldsby, Markus Stockhausen, Claudio Puntin, Guillaume Orti, Till Brönner, Dieter Manderscheid, Frank Chastenier, Henning Sieverts, Achim Kaufmann, Sebastian Hess, Hartmut Kracht, Michiel Braam, Wilbert de Joode, Jorrit Dijkstra, Oene van Geel, Peter Fessler, Moritz Eggert, Sebastian Gramss, Nils Wogram, Matthias Schubert, Rudi Mahall a.o. A discography and biography of HL, reviews etc. to download.